This duvet was exactly as described. It fit our our duvet perfectly and looks great in our room. We will have to use it to see how it holds up, but for now, it is great! Featuring holiday, novelty and traditional patterns, these luxurious and heavyweight cotton flannel duvet sets are constructed of fine fibers to retain softness and maintain appearance afer repeated washings. Brushed on both sides for ultra-soft hand and sanforized to minimize shrinkage, these duvets are designed to accomodate most pillowtop and extra deep mattresses and include internal corner ties that can secure your comforter thru its corner loops and prevent shifting. This durable oversized suvet set is machine-washable for easy care. Set includes: One duvet cover, two shams. Warm & cozy for cold winter nights. Dimensions 15.0 In. X 9.0 In. X 6.0 In. I like the weight of the duvet cover. It is perfect for cold nights. It has turned my all season insert into winter weight. The cover washed nicely and didn't shrink. It is soft to the touch. This warm heavy weight flannel is cozy and soft. 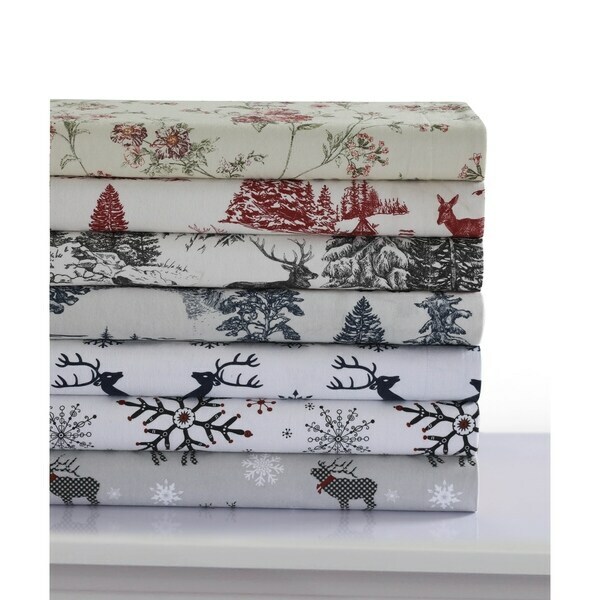 The winter toile pattern is elegant and it looks great with the matching sheet set. The size is plenty large for a nice fluffy duvet. The overall effect is inviting. Love this cover and shams. The warm biege background with floral accent is just my style. And so soft! Just what I was looking for this winter. Now looking for an excuse to get another for my spare room! I love this duvet. The flannel is top quality. Beautiful design. Duvet cover is pretty and warm. I really like how wide this is! It’s really soft and warm, and has withstood several washings. Would definitely buy again.